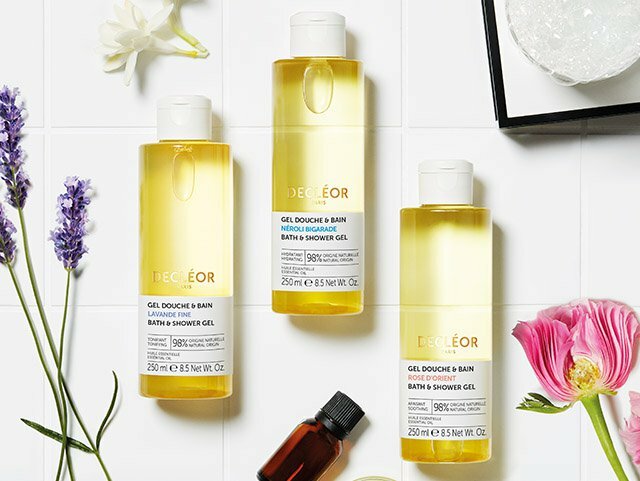 Introducing Decleor’s new Essential Oil Bath & Shower Gels: Energising Neroli, Relaxing Lavender and Soothing Rose. Using shower gel is an essential part of your daily routine. But have you found a shower gel that suits your skin and mood each day? Take your pick from these three gorgeous shower gels – they’re a great introduction to the world of Decleor. With Decleor’s focus as an Essential Oil skincare brand, each shower gel is 98% Natural origin and contains powerful Essential Oils, to leave your skin feeling soft, smooth and protected. Neroli Bigarade essential oil has origins in Tunisia and Morocco. It has a rich, fresh sweet, ethereal, floral note with a delicate balsamic undertone. Also known as ‘orange blossom’, it takes about 1000 lbs. of orange blossoms to make 1 lb. of Neroli oil. Lavender fine essential oil is sourced from France, and is the perfect scent to leave you feeling relaxed all day. Lavender essential oil is cleansing, refreshing and has a soothing and anti-inflammatory effect on skin, body and mind. Rose D’Orient essential oil is also known as Bulgarian and Turkish rose. Rose essential oil has a deeply nourishing properties, so if you are in need of soothing choose Rose D’ Orient. * consumers test under dermatological control on 106 people with sensitive skin. I know which one is my favourite! What’s yours? If you are interested in these beautiful Bath & Shower Gels – give me call at the salon.